I like to think of it as my first act of food writing. It was just a few sentences on the back of a postcard (I’ve loved postcards for a very long time), sent home to my family on my first trip to Europe when I was in college. If you were to mention just the word “postcard” to a member of my family, I’d put money on any one of them to use their pretend-I’m-a-flowery-writer voice and recite a few words of what I wrote. To this day I have not shaken, and am convinced I never will, their harassment. The busload of students I was traveling with was meeting for departure soon, and here I was just settling in for tea in a small shop near in the little town of Kent in England. I knew there would not be time to enjoy the full service, so I ordered a plate of scones and congratulated myself on my restraint. There was no lighting a fire under anyone in that tea room, I discovered, no matter how many times I looked at my watch. When the plate finally arrived, I started to imagine how I was going to explain to my parents that I’d missed the bus and stayed in a hotel in Kent (“It was the scones! The scones made me miss the bus!”). No, there was not time to eat the scones even if I shoved them in whole and demonstrated my exceptional ability to be an improper American. Instead I prepared to pocket them, wrapped in a napkin. I cut each one open, spread them with fresh butter, slathered them with Devonshire cream, and dolloped them with the reddest raspberry jam I’d ever seen. And that, in a nutshell, is precisely what I wrote on the postcard from England. You’d think it would be my liberal use of words like “slathered” and “dolloped” that would get to them, but the sibling-taunt has been fixated on the fresh butter. I’ve been teased so much about it over the years that I’ve reported all of them for bullying and wondered if having a big family is really so great after all…. But it’s true, I had not tasted butter quite like that before; I associated it with freshness, and I wanted to tell someone. Perhaps I should have sent the postcard to a friend, or to myself, or to Sitto. Sitto would have understood. She would have pinned the card to her refrigerator and reminisced about the fresh butter of her youth on the farm where she grew up. Never mind that she probably hadn’t eaten many, if any, a scone in her lifetime. Unlike my quest to replicate certain outstanding foods I’ve eaten, there has been no serious quest for the scone. I’ve left that to my sister, who is a tea aficionado and in turn a scone professional. She has baked every scone recipe to be had. Last summer when she made these raspberry scones using the jam from the raspberries we picked, she said that even though hers were round that day, the original recipe turned out heart-shaped scones with a glaze scented with rosewater. She remembered too how my mom once sent her homemade heart-shaped scones when she was in college. I noted then and there that we’d have them here, for Valentine’s Day, and as it turns out, for Fat Tuesday. Peg has given us her pointers, and she will be happy to know that I still have a jar of the raspberry jam from summer (amazing that a jar of quick jam, not sterile-preserved, has held on so perfectly in the fridge—unopened—all these months). She didn’t let me get off our phone conversation about the scones without giving me her favorite tip of all: if you want them to be really good, be sure to use fresh butter. And don’t miss the bus over it. Peg says to handle the dough gingerly, and as little as possible. When combining the scraps, push them together rather than kneading them to recombine. Make sure your (fresh) butter is very cold. And go easy easy, very easy, on the rose water. One tiny drop, then taste. It will likely give you all you need for just a hint of rose. This recipe is adapted from Bon Appetit. Whisk flour, sugar, baking powder, and 1/2 teaspoon salt in large bowl. Add butter; rub in with fingertips until mixture resembles fine meal. Gradually add the cream, mixing just until dough comes together. Turn dough out onto sheet lightly floured work surface; pat to 1/2-inch thickness. 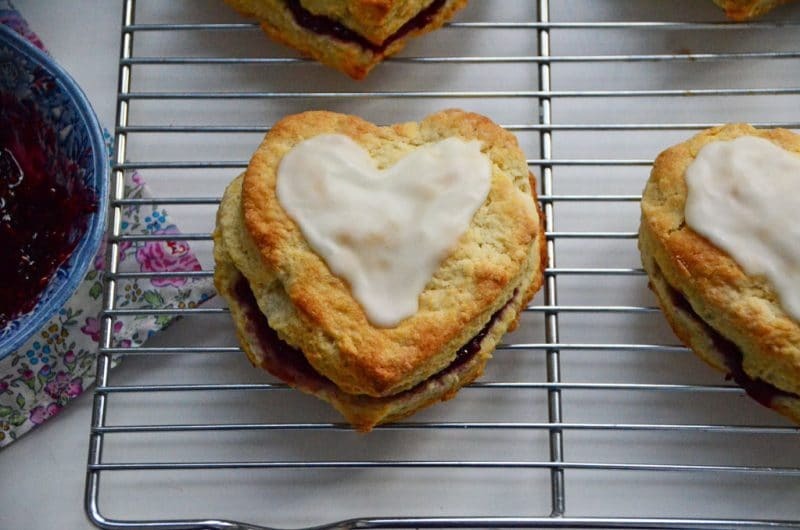 Using 3-inch heart-shaped or round cookie cutter, cut out scones. 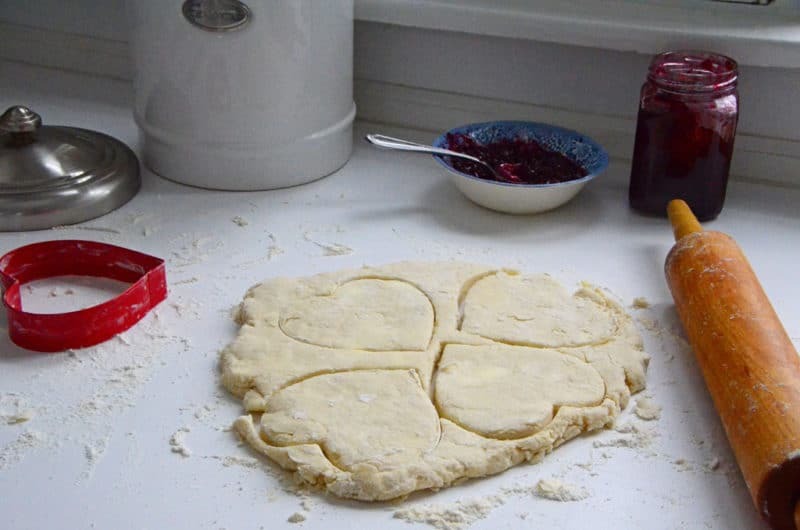 Gather scraps; pat to 1/2-inch thickness and cut out additional scones. 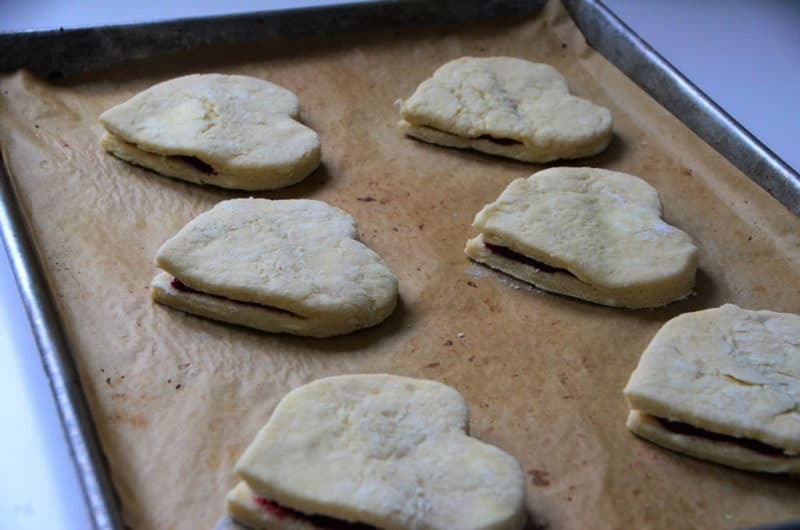 Use a floured, sharp knife to cut the scones horizontally. Start at the point of each heart and cut horizontally halfway through. Mix the raspberry jam with a (tiny) drop of rose water. Fill the cut scones with a generous teaspoon of jam (jam will show slightly at the edges). Transfer to the baking sheet. 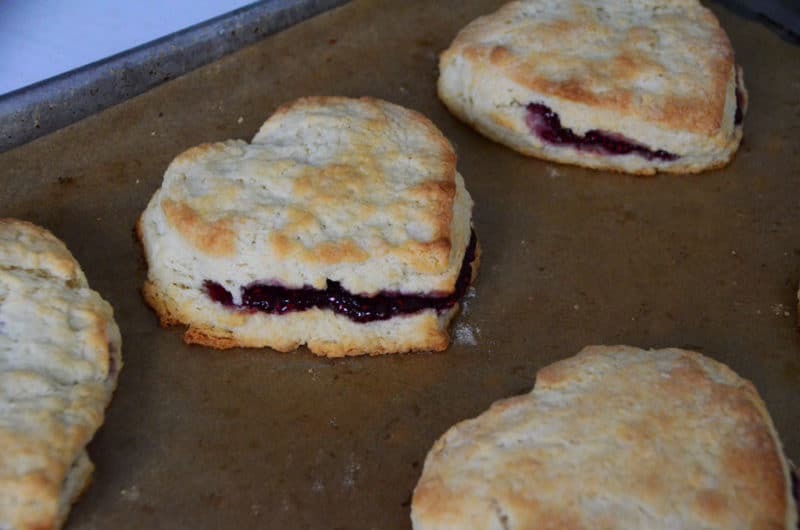 Bake scones until golden, about 18 minutes. Transfer to rack; cool scones until slightly warm. For the glaze, in a small bowl mix the powdered sugar with two tablespoons of the milk or water, and rose water in bowl to blend. Add more liquid until the glaze is thick but spreadable. 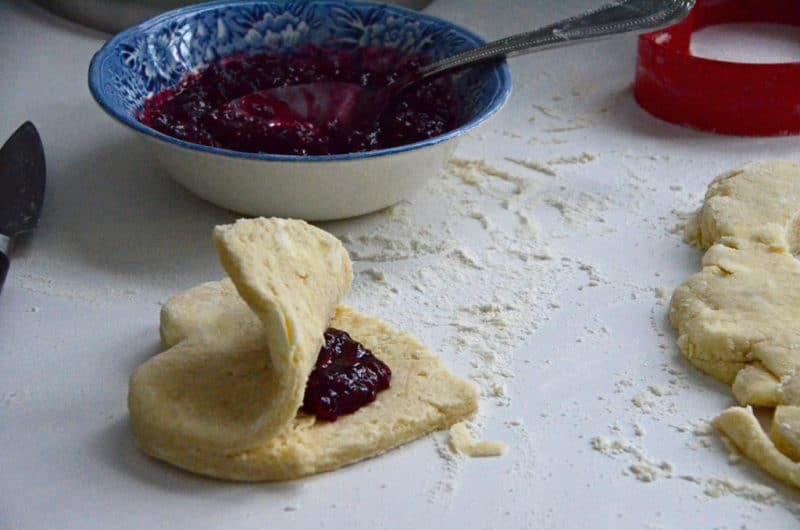 Spread glaze over scones in the shape of a heart with a spoon. Serve slightly warm or at room temperature with butter, whipped cream, and more raspberry jam. Makes 6 scones. 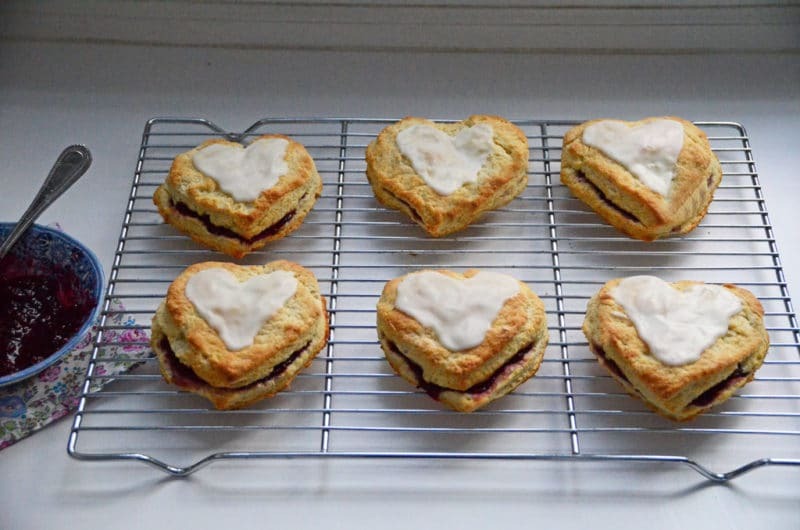 6 Responses to "Raspberry Cream Scones with Rose Water Glaze"
Best ever scones……in this world.!!!!! Stratford-upon-avon with a wonderful Hot Choc I have never forgotten them….Yes, with Clotted Cream and Fresh “R” jam. and…,Fresh butter. Worth a trip back there. I’d want to retire in a small English village and eat scones like this every day! Happy Valentine’s! I went to high school with Alicia and clicked on the link she posted on Facebook. Now I’m wishing I would have waited until this evening, because I can’t tear myself away from your gorgeous writing and I have work to do! Your blog is just lovely and I will stay tuned. I love the use of the rose water in both the dough and the glaze but I love the story even more! I remember visiting Victoria in Canada with the family and needing to catch the ferry but first we just had to stop at a traditional English tea room for tea and crumpets with the kids. We did make it to the ferry on time but we were pushing it a bit – no matter – the tea and scones and clotted cream and jams were well worth the risk! I would like to make these. I just picked fresh Raspberries from my garden. I was wondering, if I could use these instead of Jelly, we do not like Jelly? And what kind of Cream do you use? Hi Cece–thanks for your question. You can try the fresh raspberries; the flavor will be delicious but you may find the berries release a lot of juice. Use heavy whipping cream.